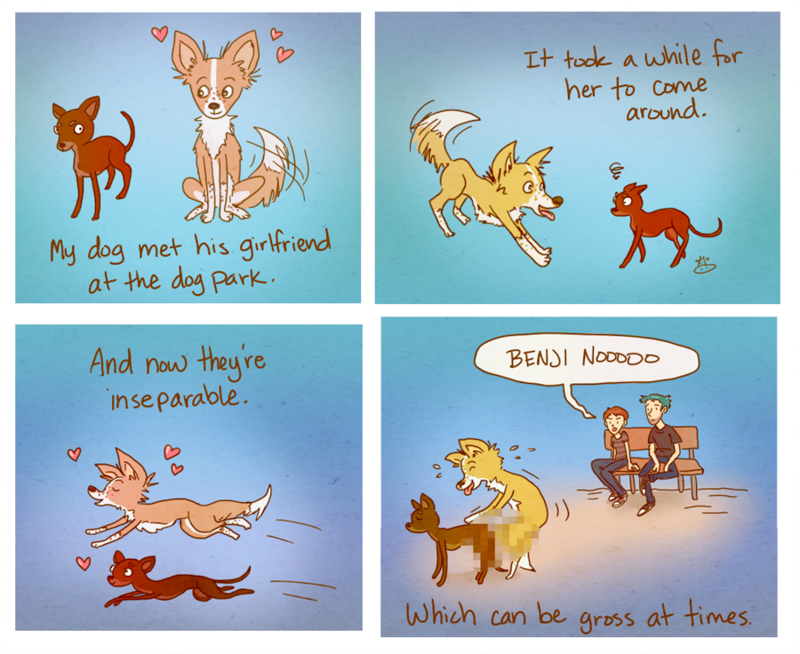 I got a doggo, his name's Benji...and he got a girlfriend! He is pretty adorable, I don't blame her for falling in love. It's been fun having a dog, I've only had him since July. Kinda wish the cats liked him, but what can ya do! why cant I be as good at socialising as Benji? up to the third panel I mean. haha, he's actually pretty shy and socially awkward...he doesn't really let anyone pet him. :P I'm the only human he likes...so uh, there's hope for you, yep! This is good. You show the expressions and the postures of the dogs well, and what could be cuter than 'puppy' love? He's quite the horn dog isn't he? Yeah he's like my teenage son! >.< I don't wanna see that! So glad you posted again! I've missed your art :) What kind of dog is he? Proxy eeeeee! :D Hi! I gotta catch up on your comic, I miss Project Arc!